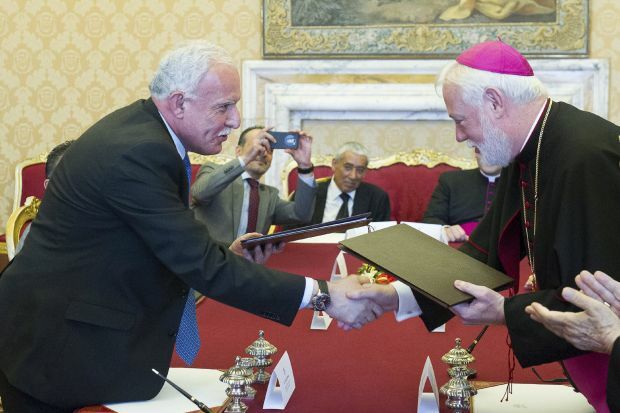 VATICAN CITY (CNS) — The Holy See and Palestine have signed a historic agreement that supports a two-state solution to the ongoing conflict in the Holy Land, based on the 1967 borders between Israel and Palestine. “I also hope the much desired two-state solution may become a reality as soon as possible,” the archbishop said. He said the peace process could only move forward if it were “negotiated between the parties,” along with the support of the international community. In his address, Palestine Foreign Minister Riad al-Malki, underlined that the agreement supports the two-state solution based on Israel and Palestine’s 1967 borders. He said the agreement includes “new and unprecedented provisions related to the special status of Palestine as the birthplace of Christianity” and cradle of monotheistic religions. The agreement comes at a time of “extremism, barbaric violence and ignorance” in the Middle East, noted al-Malki, adding that Palestine was committed to combat extremism and to promote tolerance, human rights and religious freedom. The latter are values that “reflect the beliefs and aspirations of the Palestinian people,” he said. The “Comprehensive Agreement” follows up on the “Basic Agreement,” signed in 2000, between the Holy See and the Palestinian Liberation Organization and was the result of years-long bilateral negotiations. “For the first time, the agreement includes an official recognition by the Holy See of Palestine as a state,” noted al-Malki in his speech. Passionist Father Ciro Benedettini, a Vatican spokesman, told Catholic News Service the agreement is not the first time the Vatican recognizes Palestine as a state. Without fanfare, the Vatican has been referring to the “State of Palestine” at least since January 2013. The “Annuario Pontificio,” the Vatican’s official yearbook, lists a diplomatic relationship with the “State of Palestine.” Furthermore, the Vatican had praised the United Nations’ recognition of Palestinian sovereignty in 2012. Israel issued sharp disapproval of the new agreement. The day before the signing, Pope Francis met with a delegation of B’nai B’rith International, a Jewish organization that seeks to serve the Jewish community and defend against anti-Semitism. During their meeting at the Vatican, the pope expressed gratitude for the “great progress” made between the Catholic Church and the Jewish community since the Second Vatican Council.